← May I Ask a Favor? 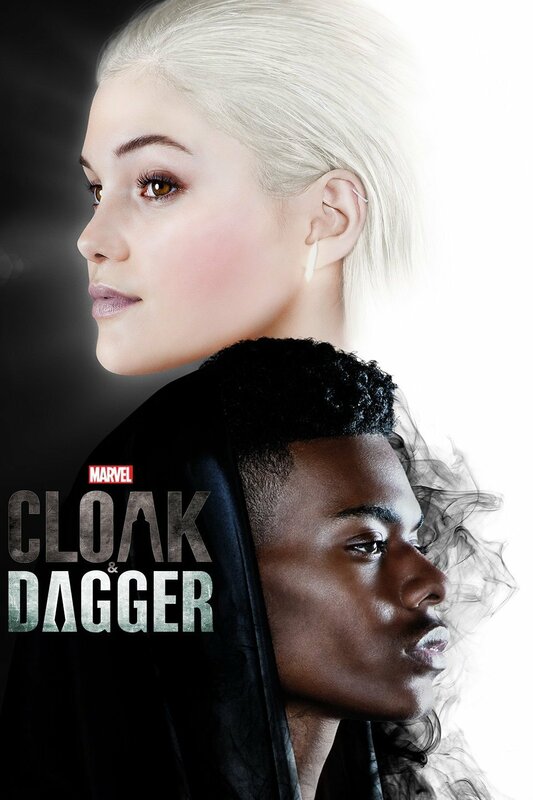 Cloak and Dagger follows the adventures of Tandy Bowen and Tyrone Johnson in their corner of the Marvel Cinematic Universe. Through a not-entirely-explained series of events and happenstance, they gain superpowers. Tandy can make daggers of light, and Tyrone can teleport about in a cloak of darkness. There’s a little more to it than that, but that’s the basic, Level One explanation. The two of them are quite different from each other, but there is a strength that they share, and they bond over their individual and shared experiences, which often mirror one another. Basically, they complement each other quite well, though there is always friction between them. The idea behind the show, as with the comics, is that this is, overall, their love story. They’re not diving into that immediately, though, which is nice, but you know it’s going happen eventually, so long as the show lasts long enough for it. Instead, they focus on what these two teenage heroes are trying to accomplish. Tandy spends most of the first season trying to redeem her father’s name and bring justice to the powerful company which dirtied his name, let its own workers die, and is still putting the entire city in grave danger just for the sake of profit. Tyrone similarly wanted to redeem his brother’s name, and bring justice to the corrupt officer responsible for his death, and for a great deal of other suffering. Once both quests are fulfilled, they turn their attentions, in the new season, to serving justice and mercy in general throughout their home city of New Orleans. Alongside these two are Tandy’s mother, Tyrone’s parents and first girlfriend, and his girlfriend’s mother, the latter two also providing voodoo-based guidance for Tyrone’s part off the journey. Most of all, however, is Brigid O’Reilly, a female officer fresh from New York. She is a capable, stalwart ally, but something of an outsider even within the police force and possessing a dangerous edge. That, it turns out, seems to be part of the second season’s subject matter. It would appear that, in a show about two people coming together almost as one, O’Reilly has somehow been changed from one person into two. Now that should prove interesting! All of this, however, is just surface stuff. The real meat and potatoes of the show is how it continually delves deeper, into who these people are. Tandy and Tyrone, for instance, have the ability to enter people’s minds, one to see their hopes, and the other to see their fears. They see what lies beneath the surface, and they see it while they themselves wrestle with their own demons and desires. They’re learning, again and again, that sometimes things don’t work out the way you want, and even when it does, it might not be what you imagined. In short, they’re a pair of young souls trying to survive, and do good, but find it a much more difficult and harrowing experience than they ever imagined. All in all, it’s generally a riveting, suspenseful, emotional experience. But I wonder a little about how much direction the show really means to go in. For one thing, it feels very far removed from the rest of the MCU, much like the Defender-themed shows of Netflix and especially in light of the unfolding events of Infinity War and Endgame. For another, after a rather capable build-up towards last season’s finale, the climax felt rather… anticlimactic. There was so much drama going on, and the end just felt like it didn’t so much release it so much as just drop it and let it roll away. Rating: for now, 8 stars out of 10. This entry was posted in Tuesday Review, TV Shows and tagged Cloak and Dagger, Marvel Cinematic Universe. Bookmark the permalink. I love Cloak and Dagger. But then, I have a thing for shows which aren’t predictable.